FORT WORTH, TX, August 29, 2017 /24-7PressRelease/ — The newest business park to open in the Greater Fort Worth area, Box Office Warehouse Suites, is also the most innovative and eco-friendly. One drive-by will confirm that rather bold statement. As you pull into the spacious parking lot of Box Office Warehouse Suites, you are pleasantly surprised to see a rainbow of colors. This is not an industrial park from the 50’s. This is a radical concept of brightly-painted units which scream innovation and creativity at those visiting. 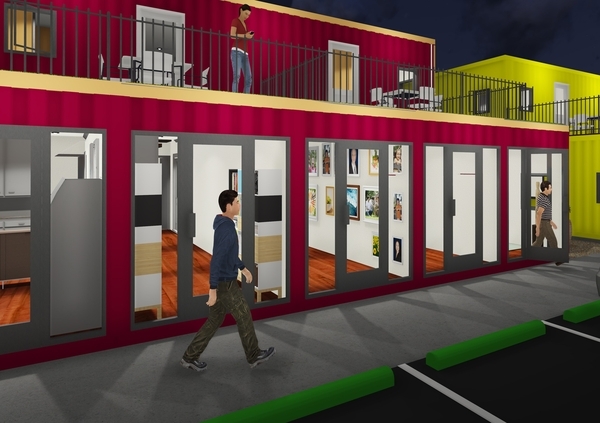 You have to look closely to realize that you are actually looking at offices made from shipping containers. You park your car at the electric car charging station, plug in, look around at the pleasant landscaping, take note of the overhead lighting for added security, and enter one of the offices, and it is at that time you receive your biggest shock. Serial entrepreneur and local real estate developer extraordinaire Ron Sturgeon hired Hue Grant of Hue Architecture to do the design work at Box Office Warehouse Suites, and one look at the interior of the units will have you wondering how it is possible that retrofitted shipping containers can look so beautiful.